518. Swaged for mortise installations. 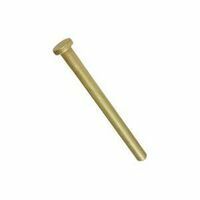 Manufactured from cold-rolled steel, with non-removable steel pin. Tight pin to allow for left or right hand applications. Boxed loose. Five knuckle full mortise design. 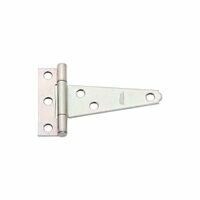 Allows easy installation or removal of lightweight doors. Screws included. Offset screw holes for extra strength and to prevent wood from splitting. Tight pin for left or right hand applications. Steel with aluminum pin. Safe working load: 18 lbs. Visual-pack. Heavy-gauge cold-rolled steel for added strength. Flush pin for finished appearance. Five knuckle, full mortise design. Screw holes are countersunk. Removable pin for easier installation. Screws included. Heavy-gauge cold-rolled steel for added strength. Flush pin for finished appearance. Five knuckle, full mortise design. Screw holes are countersunk. Removable pin for easier installation. Screws included. Heavy-gauge cold-rolled steel for added strength. Nib on hinge for finished appearance. Five knuckle, full mortise design. Screw holes are countersunk. Removable pin for easier installation. Heavy-gauge cold-rolled steel for added strength. Nib on hinge for finished appearance. Five knuckle, full mortise design. Screw holes are countersunk. Removable pin for easier installation. Heavy-gauge cold-rolled steel for added strength. Nib on hinge for finished appearance. Five knuckle, full mortise design. Screw holes are countersunk. Removable pin for easier installation or removal of doors. Heavy-gauge cold-rolled steel for added strength. Nib on hinge for finished appearance. Five knuckle, full mortise design. Screw holes are countersunk. 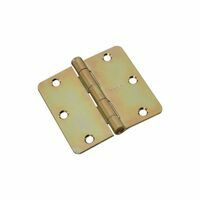 Removable pin for easier installation or removal of doors. Heavy-gauge cold-rolled steel for added strength. Flush pin for finished appearance. Five knuckle, full mortise design. Screw holes are countersunk. Removable pin for easier installation. Heavy-gauge cold-rolled steel for added strength. Flush pin for finished appearance. Five knuckle, full mortise design. Screw holes are countersunk. Removable pin for easier installation. Five knuckle full mortise design. Allows easy installation or removal of lightweight cabinet doors. Screws included. Lightweight steel construction. 3 Knuckles. 504. Designed for general utility and industrial applications. 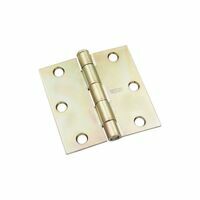 Hinges are swaged for mortise installations. Loose pin allows doors to be removed without taking off hinges. Plain steel version can be welded. Boxed. Use in both the interior and exterior. Screws included.